Wen Yau is a cross-media artist, researcher, curator and writer whose work focuses on performance/live art and time-based media. She has showcased her works in Asia Pacific, Europe and Americas, often grappling with cultural differences and intimacy in public space. A recipient of the Fulbright Scholarship to visit the Northwestern University, USA in 2015-2016, Wen Yau has recently finished her PhD thesis on the performative practices in postcolonial Hong Kong art and activism. By using an auto-ethnographic research methodology as well as the lens of performance studies, she intends to investigate local artists’ involvement in social movement in the territory in relation to the building of identity and subjectivity in Hong Kong society. Her broader research interests include: social and public practices of art, performance art, Hong Kong art and culture, and research methodology. 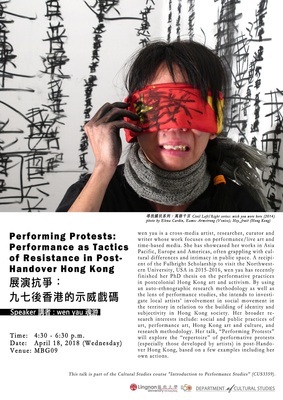 Her talk, “Performing Protests” will explore the “repertoire” of performative protests (especially those developed by artists) in post-Handover Hong Kong, based on a few examples including her own actions. This talk is part of the Cultural Studies course "Introduction to Performance Studies” (CUS3359).